With his first feature film, director Colin Trevorrow (with the help of screenwriter Derek Connolly) has conjured up this gem that pokes fun at, while still embracing adolescence and growing up. It all starts with our lead female played by character actor Aubrey Plaza – who has always had a certain quality to her presence and to her line-reading that can be summed up in one word: pubescent. In Safety Not Guaranteed, she plays Darius. Darius has been interning at a magazine company. She’s given crappy tasks and is usually berated by her boss Bridget (played by Mary Lynn Rajskub). This causes Darius to stew in sarcasm and cynicism; almost how a teenage girl would when she’s been told to do something she doesn’t want to. Darius is assigned to cover a story thought up by a flakey employee, Jeff (played by Jake Johnson). The two head out on the road with another intern, Arnau (played by Karan Soni). Jeff finds an article in the classified section that has been written by a peculiar individual seeking a partner to travel back in time with. The sparsely written article explains that this brave traveler must bring their own weapons and honestly states that the poster has only done this procedure once before. The article has been an internet joke for many years; often being paired with a picture of a straight-laced mullet-wearing oddball (to which Mark Duplass has fittingly and quite successfully fulfilled this role as Kennteh) while Paul Engemann sings Push it to the Limit over the image. It’s a strange “meme”, and Trevorrow as well as Connolly are aware of that, but what their film thankfully offers is the perspective that not only is the poster serious about this mysterious time-traveling trip, but also that this innocence and oblivion to the obvious could highlight how people around this bizarre ad could be just as innocent and oblivious. As Darius does some undercover research and hangs out with Kenneth, movie goers can see how much she opens up to this stranger and how this happier, more joyous side of Plaza’s character has spruced. It isn’t because Plaza and Duplass are both involved in an indie cliche of “these two eccentric goofballs are finally finding each other and now are finding a normality in their weirdness”. It’s more-so Duplass exceptionally playing his role straight, without winking at the camera, and Darius becoming jealous of Kenneth’s simple-mindedness and, eventually, giving in to him and figuring out a playful side to life. A scene where Kenneth is taking Darius through boot camp is a perfect scene showcasing Duplass handling matters very seriously, while Plaza (knocking it out of the park, I might add) running after him and, for the first time, joyously smiling. The supporting cast, while not having as much as an uplifting journey as Darius does, also deals with living in the past and choosing whether or not to grow up. Jeff’s original motive behind the time-traveling story is that he can visit his hometown and hook up with an old flame. Arnau, on the other hand, is very quiet and very bright, but is even more innocent than Kenneth; not knowing how to properly initiate conversations. 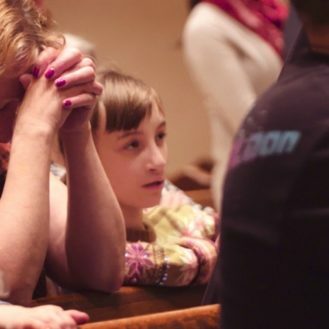 There isn’t exactly the right amount of closure to Jeff and, definitely, Arnau’s story. In Jeff’s case, maybe that was Connolly’s intent. Maybe it’s because Jeff’s conclusion isn’t exactly the happiest when mirrored to Darius’ and that’s why audiences will feel unfulfilled. Are the downer-beats necessary? Sure. They highlight Jeff’s flaws and emphasize just how troubled that character is. I just wish Connolly let up a teensy bit. Safety Not Guaranteed has a genuine sincerity that other movies dealing with oddball characters would be jealous of. The chemistry amongst the cast all clicks and it feels like these actors don’t necessarily have to stretch in order to find a resonating note. It’s a finely casted flick. But, its the director and the screenwriter who deserve most of the recognition. Again, their knowingness to realize where “crazy” lies and their ability to spin that and make it relatable and “normal” is much appreciated and benefits their film greatly. And, that ending. That ending is a doozy and is, without a doubt, one of the most satisfying wrap-ups a film in 2012 has to offer. 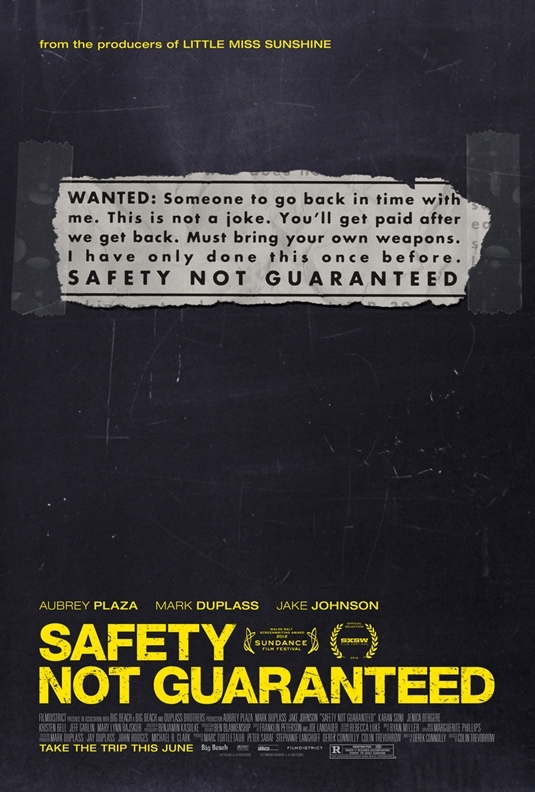 It’s an ending that almost forces you to cast away all the minor quibbles you had with Safety Not Guaranteed. Ah! That’s enough from me. I’ve already almost spilled too many beans. Now, if only I could travel back-in-time through a word document….